Assassin’s Creed Unity shares two similarities to The Master Chief Collection: both were released on November 11th, and both are still broken today. 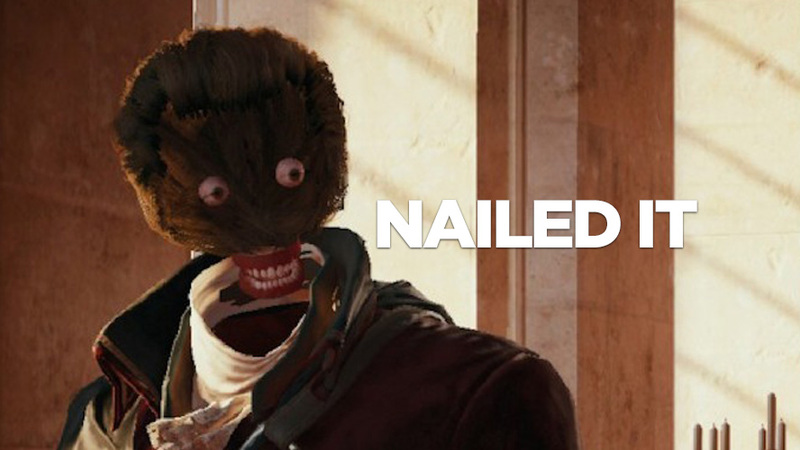 Missing textures from faces to create nightmare fuel are just the beginning of ACU’s woes. And with the last patch being a roughly 6GB download—a very large pill to swallow already—there seems to be a new bug with the latest update patch on the Xbox One version, as users who own the digital version of the game will need to download the entire 40GB game again to update. Something that should be noted about the Assassin’s Creed series: If you go by console releases, an Assassin’s Creed game has been released at least once per year since 2009; 2007, if you count portable games. A new Assassin’s Creed game, Victory, has been announced for the end of 2015. In order to be turning out that kind of demand, Ubisoft needs to be working on these games years in advance. Black Flag came out in 2013 on 5 different gaming platforms, including next-gen systems, Playstation 4, Xbox One and Wii U—the game was given high praise and scores. Unity, in contrast, has only been released on PS4 and Xbox One with less than satisfactory reviews, because of their problems. With today’s digital age of software distribution, it’s easy to just ignore bugs during development and just say, “We’ll fix it post-launch.” And sadly, we’re going to see this happen more and more. Why? Because, despite these issues, we keep buying $60+ titles with the expectation that, someday, the game-breaking issues will be fixed. Studios need to go back to the roots of gaming, where the final product could never be updated. If a studio was lazy with the coding or just stressed on time because of deadlines, it’s permanently there, never to be altered or updated. Lack of high scoring reviews and sales should be a reminder to focus more on quality work instead of keeping with a schedule. This is why early access developers on Steam have reduced rates on games while they’re in development, and why Valve will keep everyone in the dark about a release date for their next award-winning title… until they’re ready to let you play it. But the AAA studios? They’ll keep pushing out half-finished games for pre-Holiday deadlines and worry about patching the issues later, while they push their season passes and preorder bonuses for the $100+ exclusive day-one DLC version of the same game. Which are getting D+ scores because the developers were focused on racing for a launch date instead of waiting and releasing AAA-quality games. The saddest part of all is how members of the industry, such as Assassin’s Creed 3 creative director, Alex Hutchinson, saw this coming years ago and described this AAA development style as a “cancerous growth”. As gamers and customers, we should hold back on preorders and purchases of these half-finished products and only invest our money in products that are ready to ship. Otherwise, we’ll just keep getting games that are rushed. And not the Fly On A Dog kind either.